Rooftop Bees for Richmond Restaurants | News and Features | Style Weekly - Richmond, VA local news, arts, and events. Beekeeper David Stover placed these hives in the backyard of a house in Westover Hills. 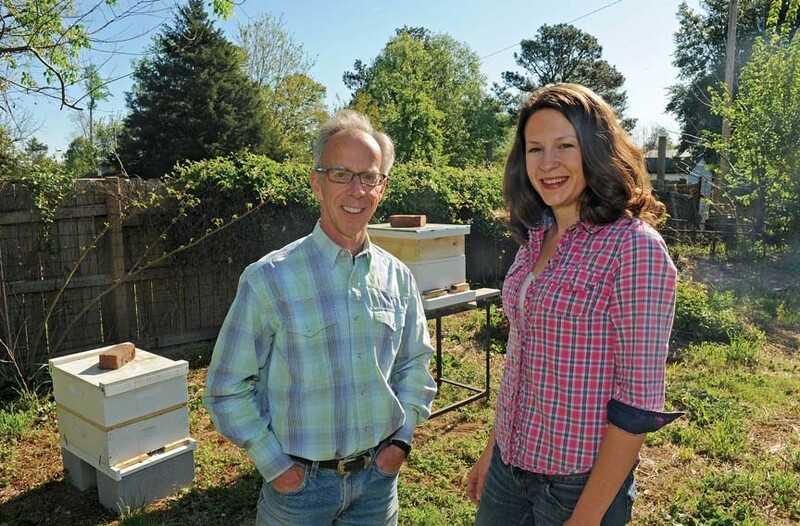 He and organic gardener Nina Zinn hope to bring hives to Richmond’s restaurants too. When it comes to food sourcing, you can't get much more local than upstairs. So will Richmond's restaurants sign up for rooftop beehives? Local beekeeper David Stover and expert gardener Nina Zinn, owner of Urban Backyard Edibles, are teaming up to convince Richmond restaurants to buy into beehives. For a $500 initial fee, Stover will install a hive — buzzing residents included — and provide all the necessary supplies. He charges $90 per month to maintain a hive from April through November, the bees' buzzy season. If chefs or homeowners want to do the work, Stover will mentor them for the same rate. The idea has taken off elsewhere. 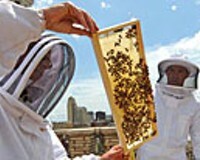 In 2009, the Fairmont Hotel in Washington installed three hives on its roof, which are home to as many as 90,000 Italian honeybees. Chefs harvest buckets of honey for restaurant dishes and a bee-tini that's made with vanilla vodka and lemon juice. Stover and Zinn have installed four hives in Richmonders' backyards. And this week Zinn will get her certification as a LiveRoof installer, which will allow her to create modular rooftop vegetable gardens, which could be pollinated by the clients' bees. State law says that people who produce honey from their personal hives may sell it without being subject to state inspection, as long as they sell fewer than 250 gallons of honey a year. It's unclear if this exemption would apply to restaurants, Zinn says; she's speaking with Health Department officials to find out. Of course there are a few considerations restaurants — and homeowners — should address before diving into hive keeping. Number one is neighbors. "One should either talk with them or just not do it," Stover says. The Roosevelt, a popular new restaurant in Church Hill, was interested in a hive, he says, but decided against it because of an apartment upstairs. A rooftop hive presents no dangers, Stover says, because honeybees aren't aggressive creatures: "Bees fly out in the morning, go up in the air and they're gone." While getting stung is an unavoidable risk for a hands-on beekeeper, there's little work that needs to be done with a normal hive, Stover says. "The less you mess with the bees, the happier they are."